Fremantle fascinates and bewilders me, there always seems to be a level of drama in play or brewing. This club’s history, albeit short, makes fascinating reading. No other club has done it quite like Fremantle, they have the capacity to make the easy look difficult, and on occasions, the impossible look possible. Fremantle has morphed into a successful club from a corporate perspective but to the outside world they still appear to struggle with their on-field persona and performance. Fremantle’s coaching and recruitment strategies from day one have hung over the club like a rain-bearing depression. After a period of success in 2013-2015 the pundits were telling us that this was the beginning of a period of sustained success for Fremantle, but like the GFC, the Docker’s fortunes in 2016 and beyond caught everyone off-guard. 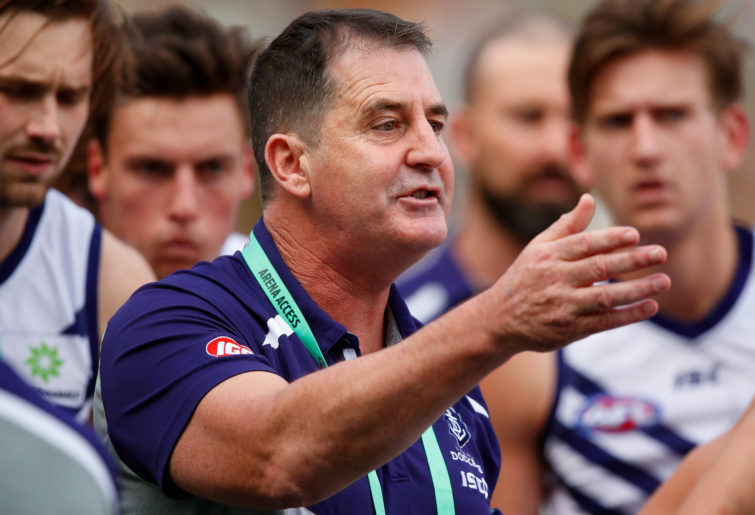 In 2019 there seems to be a quantum change in the attitude and approach of Ross Lyon. He appears to have finally realised that his stoicism and intractability will not bring about the change Fremantle is crying out for. There’s little doubt that this shift can be attributed to the appointment of Peter Bell who has shown early on that he wants to do things differently, but collaboratively. He has a genuine passion for the club, and leaks allegedly from within the inner sanctum confirm that he won’t be a pawn of Lyon, an overt weakness that plagued his predecessor. Lyon has gone from enjoying a stranglehold on his tenure to what could now best be described as “fragile, handle with care”. There’s no denying Lyon’s footy smarts, and to his credit, he appears, at long last to have finally accepted that the same game plan can’t be applied in perpetuity. This will be music to the ears of the Freo faithful who at the end of last year were proposing a funeral pyre for their beleaguered coach as a reward for the 2018 season. Five months on, and changes to personnel and players at the club seem to have assuaged the disenfranchised. My Fremantle-supporting friends are not getting carried away with what might be, they’ve been down that path too many times and just want to see an improvement in game plan, continued development of the younger players, and a stable personnel structure guiding the club. Hats off to Peter Bell for overseeing arguably the best trade period in the Dockers’ history. The acquisition of Jesse Hogan and Rory Lobb was the result of some astute trading and there’s every reason to believe they could help transform Fremantle into a serious top eight contender. If Hogan can stay fit and on the park he will be a tremendous asset, but given his past injury and health issues it’s not unreasonable to classify him as medium risk, high return. This is not a case of caveat emptor, just a realistic assessment of the player and his history. I hope Jesse can give Fremantle what they’ve been crying out for, both he and Fremantle deserve that. Lobb truly is the dark horse, tall, athletic, great pair of hands and a nightmare for any back man. He needs to work on his consistency, but if he is allowed to settle into the forward line and apply his craft then he becomes a genuine weapon. If I was a Fremantle supporter I’d really be looking forward to 2019. Indications are that it will be a season of improvement and there is much to like about the younger brigade and the thought of Hogan and Lobb plying their trades in the forward line should have you responding like Pavlov’s dog. NB: not to be confused with Pav’s dog, assuming he has one!